The first step for the body on the road towards mummification was the purification - the body was washed and cleansed using water containing natron (natron was the drying agent, this step was not part of drying the body out, that would come later). 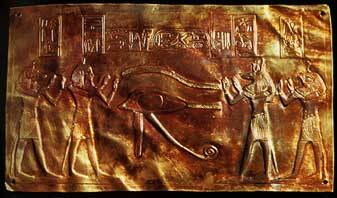 during the 18th dynasty this position changed slightly to one from the hip to the pubic are (position 2). Once the organs were removed, the remaining space within the body was then cleansed and filled with a temporary stuffing - the organs were treated with the same proceedure as the rest of the body, they were even individually wrapped in linen and placed in the tomb. The placement of the internal organs in the tomb varies - up to the 21st dynasty they were placed within canopic jars, during the 21st dynasty the organs (still wrapped in linen) were placed back in the body, and in the Late Period the organs were placed between the legs of the mummy. 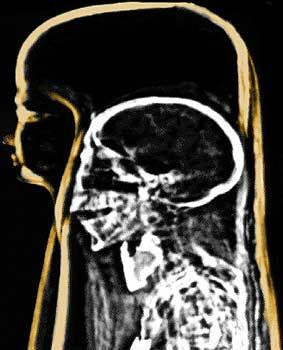 CT-scan of mummy from 22nd dynasty, the highlighted area shows wrapped organs which had been placed back into the body cavity (the spinal cord is a the base of the picture). The brain was also removed (this practice seems to have started around the time of the late Middle Kingdom, or early New Kingdom period onwards), a hole was punched through the thin bone at the top of the nostrils (the Ethmoid bone) - modern experiments made by Bob Brier, have shown that the brain needs to be 'whisked up' into a sort of liquid before the body is placed face-down allowing the brain then to pour out through the nose. Sometimes an incision at the base of the neck would be used to removed the brain. Once the brain had been removed, a coating of resin was then applied to the face. The one organ that was not removed was the heart - the heart was seen as most important to keep within the body, it was thought of as the place of wisdom, intelligence in the body. If the deceased were ever to reach the Beyond it was essential that the body and heart were not separated (the heart was needed in the Weighing of the Heart ceremony), The heart was not to be cut from the body - if this happened accidently with the removal of the other internal organs then it was later put back. Possibly on the 16th day after death, the body was put into a bath of natron - modern analysis has identified this as a natural salt of Sodium Carbonate, Sodium Bicarbonate (along with some smaller amounts of Sodium Sulphate and Sodium Chloride). The cavities made in the body by the extraction of the internal organs were also packed with natron - so that the drying process caused by the natron happened both inside and outside the body. It was originally thought that the body was laid into a water solution which held the natron - but it is now known that the desired results are only achievable when the natron is dry and literally heaped onto the body. After 40 days the body would have been completely dessicated - all moisture would have been removed, and the body safe from further decay. It was at this point in some periods that the mummies were also covered with hot resin as a further protection against decay (for example the mummy of Tutankhamun). In the 3rd Intermediate period mummies had linen and other items packed under the skin to give the deceased a more life-like appearance (the height of the mummification proceedure dates from thie period). The bodies were also sometimes coloured - men were painted red, women painted yellow - henna was rubbed onto the hands and feet. In the Graeco-Roman period gold leaf was applied to parts of the body, and female mummies had their faces painted and their eyes highlighted. The Wrapping of the Mummy. Once the individual parts of the body had been wrapped, the body was then completely wrapped from head to toe using layers and layers of linen - the positioning of the arms during this final wrapping varied over the centuries (sometimes the arms were crossed - as in the above picture - or extended down to the groin - or straight down by the sides of the body). The final moment of wrapping was the use of a single large sheet of linen which covered the whole mummy which was then secured by linen bands (in the New Kingdom the linen sheet was dyed red, in the 21st Dynasty red leather straps crossed over the shoulders, in the Late Period the body was covered by a net of blue faience beads). The use of masks with the burial dates originally to the Middle Kingdom, during some periods throughout the rest of ancient Egyptian history a mask made from cartonnage was placed over the head and shoulders of the mummy. The mask was painted - in royal burials the mask was made from gold and precious stones. During Late Graeco-Roman periods the mask consisted of a face mask which was placed over intricate criss-crossing bandaging - these masks would show the dead person as if resting on a pillow. During the Roman Period, the living would have a portrait made of themselves during life - this same portrait was then placed over the head of the mummy. 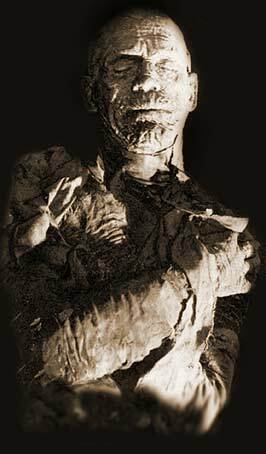 Once the mask was in place further amounts of resin were poured over the mummy as well as perfumes and unguents - finally the mummy would be placed in the coffin just before burial. With the advent of Christainity into Egypt, the practice of mummification gradually dissappeared - although burials have been found dating to the fourth Century AD which show a limited form of the mummification technique.